Posted on June 24, 2011, in Blog, Translations and tagged Yajima Maimi. Bookmark the permalink. 8 Comments. and a NEW DVD?! no to e-Hello! please! more surprising?! O.o looking forward to it! Ah, my bad, I worded that poorly. 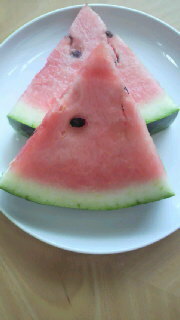 It was more like “As for me, I ate watermelon” or “I, myself, ate watermelon”. Though it’s well within the realm of believability, she didn’t say that she ate the entire watermelon herself lol. i doubt its e-Hello.. since she already released one of those already.. >.<;; maybe its utb? or something.. LOL.. Unfortunately, it’s looking like it is e-Hello.